A bright, creamy soup for a chilly night. Greek lemon chicken soup is luscious, bright with citrus and soothing. It's perfect for a cold or a cold night, which are still plentiful in Humboldt in April. If you've had soupa avgolemono, you know what I'm talking about. It is one soup that lives up to the adage that chicken soup is food for the soul. 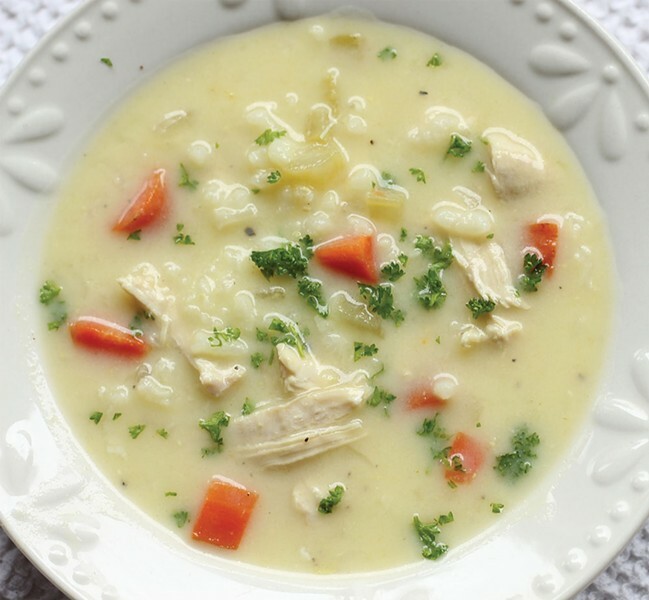 Some even call avgolemono the "Greek chicken penicillin." It's a creamy chicken soup, sans dairy, made special with eggs and lemon. The eggs thicken the soup and give it a velvety texture. The egg-lemon combo is the basis of many Greek broths and sauces, not just chicken soup. It is also common in other parts of the Mediterranean. Some food historians suggest it traces back to Sephardic Jews who were expelled from Spain in 1492. Unfortunately, I have yet to visit Greece so my barometer of avgolemono soup is what I've had here in the states: good and bad, from coast to coast over the last few decades. Some were so tart, even writing about them makes me pucker, while other versions had just a whimper of lemon. Then, there's the thickness of the soup. Many were a gloppy mess, while others were so thin it was sacrilege. The recipe below is one I've been making for nearly a decade. It falls in the middle of the sour/tart spectrum and is creamy but not overly thick. My version also leaves in the aromatic carrots and celery because I like my veg and it seems silly to discard them. My starches of choice are Arborio rice or orzo pasta, depending on what I have in the pantry. However, it does come out a little thicker with the orzo. The secret to a sumptuous avgolemono chicken soup is the stock. If you have home-made stock, all the better. If you don't, you can substitute chicken thighs for breasts, which will make for a tastier broth. However, bouillon cubes are not recommended. If you've never made or eaten avgolemono, give it a try. Just be sure to read through the recipe in its entirety first. This recipe is not hard, but it does require tempering eggs, which takes patience, so you don't end up with scrambled egg soup. The recipe makes a large pot. That's great if you have plenty of mouths to feed or want some for leftovers or freezing. By the way, this is one of those soups that tastes better the next day. Homemade chicken stock is best. If you don't have it, substitute with chicken thighs (8) for breasts to make your soup more flavorful (just be sure to add the rice after the chicken thighs are cooked). The fresh herbs are more than garnish with this soup. Don't skip them. Serves 6 to 8. In a large, heavy pot, heat olive oil on medium heat. Add the diced onion, celery and carrots. Sauté for about 2 minutes. If the vegetables and bottom of the pot get dry, add another tablespoon of olive oil before adding the chicken pieces. Barely brown the chicken. Flip the chicken and stir the vegetables once or twice to avoid over browning. Add the chicken stock, rice and 1 teaspoon salt. Bring to a slow boil, then reduce the heat to low. Simmer for about 15 to 17 minutes until the chicken and rice are cooked. Remove 1 ½ cups of broth and set it aside in a separate small bowl to cool slightly. Remove the chicken with tongs and shred it with a fork. Set aside. In a separate medium-sized bowl, whisk the room temperature eggs with the lemon juice. Very slowly whisk in ¼ cup of the set-aside chicken broth into the egg mixture to temper the eggs – this will prevent them from turning into scrambled eggs. Whisk well. Repeat, slowly whisking in ¼ cup at a time until you've incorporated all of the set-aside broth into the egg mixture. Now very slowly add the egg and broth mixture into the large pot of soup, whisking quickly and continuously to incorporate the mixture, while the soup thickens. It should take about 1 full minute. Return the shredded chicken to the pot to reheat. Do not boil the soup again. Season with black pepper and salt to taste. The avgolemono will thicken more as it sits. Serve hot and garnish with fresh parsley and/or dill. Serve with crusty bread. When reheating, warm the soup until it's hot but do not boil it.